We revolutionized the industry by creating 100% All-Inclusive Rates with ZERO Hidden Fees. Quick & Easy! We have more than 200 amazing reviews on Yelp! Price was fair, especially considering I needed to stop by a friend's house and pick up a few furniture pieces he was getting rid of. The reps were super helpful and walked me through the whole process they had planned for my move. They arrived on time and packaged everything quickly and safely. After getting my belongings from my parents' house, they drove to my friend's house a city over to grab the remainder of the furniture. Everything fit neatly in the truck and made it to Orange County by the end of the day. On the moving day, three movers came right on time and did a quick walk through with me, asking if there was any details they had to know upfront (fragile items or specific boxes they needed to know about). After the signing of paperwork, they got to work right away. As discussed with the estimator, they took great care of the furniture, carefully wrapping it with blankets and plastic. Within a couple hours, they were done with loading and were able to avoid crazy Los Angeles traffic and were at the drop of location just in an hour and some change. Movers were super fast and efficient unloading and unpacking the truck. They helped me to unload some heavy boxes and did a walk through with me to make sure everything was perfect before they left. I moved from a one bedroom to a 3 bedroom home that was 50+ miles away. I definitely needed to hire professional movers to help me move lots of boxes, heavy furniture, and disassemble/reassemble furniture. Both Tim and Ed showed up on time with a friendly smile. They worked quickly and brought free wardrobe boxes for me to use to empty my closet and also safely pack random items and bags that weren't in a box. They even helped me move my fridge! They spent about 10 hours for the entire move and did a really good job. I was very happy with their service. I'll definitely consider using them again in the future! :) Thank you! Bee movers turned around my understanding of moving services and how it should be. They were super nice and helpful from the very first email. They were flexible and ready to assist me with hundreds of questions and requests. I definitely felt like I was in safe hands. My movers Tad, Damon and Alex were great! Not a single item was scratched or damaged. They carefully wrapped every single piece of my furniture and moved everything in very carefully. I even got a follow-up call from their representative to make sure I was fully satisfied. Now that I have a reliable moving company in OC, I will absolutely use Bee movers again in the future! I can't speak anymore highly of Bee Moving. They did an excellent job. Damon and Ilker were the two mover's that helped me and my girlfriend this past weekend. From disassembling the bed to wrapping all of the miscellaneous furniture to doing all of the heavy lifting, these guys were great! They were also very fast and efficient. They were able to move an entire room in about 30 minutes! Thank You Bee Moving! I would use them again and HIGHLY recommend them to friends and fellow yelpers. They were affordable and professional and made the daunting task of moving that much easier. Impressed all around. I was moving from highland park to Pasadena and booked my movers last minute due to some previous complications with my housing situation (drama drama). They were able to schedule me on Labor Day of all days! My scheduled time was between 8-9 am and I got a call telling me they were on their way. Very punctual. The two movers were fast, efficient and friendly. They Saran wrapped my bed and my dresser and handled my stuff with care. Got a great deal too thru groupon for two movers for 3 hours. I had paid up front and they didn't charge me a dime extra. Hassle free service which lessened the headache I had going into this move. Highly recommended! Speak with one of our dedicated relocation consultant who will price and schedule your move after careful review of the logistics. Our objective is to relocate your business as efficiently and cost effectively as possible while minimizing any interference in your day to day operations. Commercial relocation requires skillful dedication that only comes with extensive experience. Since 2009, Bee Movers have done more than redefine a traditional service: We've started a new one. Guided by decades of real experience, we fuse unique moving techniques from around the world to handle your items in the safest & most efficient manner possible. 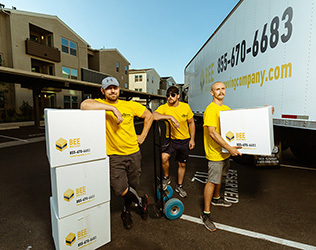 With over 8000 moves per year under our belt and eco friendly packaging supplies, it's no surprise that Bee Movers have become the most popular movers in Orange County! Absolutely! We are fully licensed, insured, & bonded. It’s very easy. Give us a call to check availability and ask any question you have about your move. Then go to reservation tab on our website and fill all necessary information out. Thats it. You will receive a confirmation e-mail with all details. Welcome to bee Moving Company! The Bee Movers won’t leave until your new place looks like a home. We have friendly and knowledgable movers who will listen & help you figure out the best place for your items. The Bee Movers are more than happy to pack, wrap, & unpack your things the way you ask. Need the den set up right away so you can watch the big game or your favorite show? Consider it done. Whether you'd like it moved an inch or to the other room, we'll stay until it's right! These days, accountability seems to be a thing of the past. We hold ourselves to a much higher standard and always find a way to make it happen! 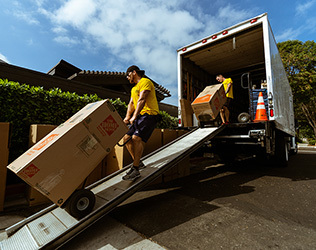 Our clean, responsible orange county movers will work as long as it takes to make your new residence a home. We never charge a service fee for packing or wrapping. You can have the guys move or pack, it’s all the same to us. We’re happy to use your packing supplies, sell you one of our all inclusive unlimited packing supply kits, or we can use what you have & supplement with our supplies on the day of the move. If it’s bigger than a microwave, chances are that it needs to be wrapped up. That’s why unlimited shrink wrap, blankets, & tapeare always included for FREE. We even offer a 100% refundable deposit if you need to hang on to some of our blankets or wardrobe boxes for a while. Just return them in good condition and we’ll give back every penny of your deposit.